Hi friends! I know I’ve been MIA since my transfer last Friday, but there hasn’t been much to report. 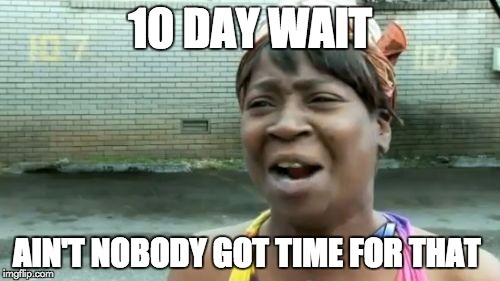 It’s all just a waiting game now and I’m left feeling like Sweet Brown…Ain’t Nobody Got Time for That. I will go to the doctor on Monday, June 15th for my beta hCG blood test to find out if I’m pregnant or not. I’m trying to keep myself occupied, but the wait is driving me a little crazy. 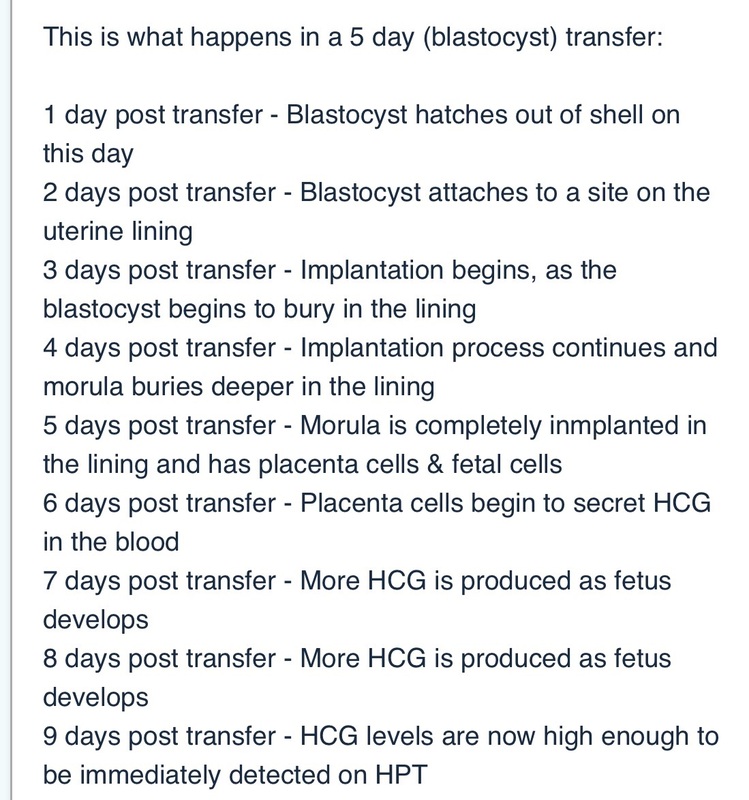 Today we are 4 days post transfer, so the embryos should really be getting to work and getting their implant on. I have done everything I can think of to encourage them to do so. First of all, I’ve been playing a lot of Justin Timberlake for them. My children have no choice but to like him, so I want to get them started early. We’ve already made it through 3 of his albums. Also, someone messaged me to recommend positive visualization of embryos implanting by a specific spoken word artist. I tried to listen to those yesterday, but Matt told me to “turn that hippy sh** off.” I listened to them this afternoon while he was gone, and they were quite enlightening. I learned that my uterus is smooth and supple. A little bit out there, but hey whatever works. I’ve also been using the relics and oils people have given me throughout our ongoing battle with infertility. My favorite saint to pray to is St. Gerard Majella. He is the patron saint of infertility as well as expectant mothers. I wear his medal around my neck every day. You won’t catch me without it. Holding onto it is the only thing that has gotten me through some of my toughest doctor appointments. He was with me the day I thought I was going to lose an ovary, and he has been with me at every appointment since. I also have a small piece of cloth that was touched to one of his relics that I like to rub on my belly. Another thing I like to rub on my belly is holy oil from the Basilica of Sainte Anne de Beaupré in Quebec, Canada. The shrine was built in honor of St. Anne, who was the mother of Mary. It has been credited with countless miracles of healing. I haven’t made my way to Canada yet, but a close family friend who suffered with infertility brought me a bottle of the oil. He and his wife conceived a month after visiting the shrine after years of exploring every option available. The funny thing about going through something like this is that everyone you meet offers different solutions that have worked for them. I can honestly say I have tried them all. I won’t be able to credit a particular saint for interceding when our little miracle comes along because I have called on so many. Instead, I will give credit to each and every person who has offered help and prayers along the way. I’ve read that when you go through your darkest times, that’s when you flex and strengthen your spiritual muscle the most and that’s when your faith grows by leaps and bounds. It’s absolutely true. When things are going well in your life, it’s easy to forget to stop and thank God. But when you struggle and you suffer and you fail to understand, faith is the only thing that pulls you through. Of course I always wish our path to parenthood could have been easier and we could have conceived with little to no effort like most people. But that wasn’t God’s plan for us. God chose us to be the 1 in 8 couples who have to struggle and fight a little harder. I’m thankful for the growth I’ve experienced in my faith and my relationship with God throughout this process. Please pray the test is positive Monday and that I can have a healthy pregnancy. If It’s negative, I can honestly tell you I will be devastated beyond belief. I know God gives his hardest battles to his strongest soldiers, though, and I will keep fighting the good fight either way. I promise to update as soon as I know something and have shared the results with family and close friends. Thank you, from the bottom of my heart, for every single prayer and positive thought you have sent our way.